Why do children love Elmo from Sesame Street so much? Why are kids so obsessed with that short red Sesame Street muppet? If you have a child between the ages of 1 and 4 who has ever watched TV, had a play date, gone to daycare or preschool or been inside a toy store, he or she is probably obsessed with Elmo. My son first showed symptoms at 10 or 11 months, when I picked him up from daycare one day and saw him gleefully riding an Elmo car. For the first time in his life, he looked disappointed to see me. What is it with kids and that round-headed, perpetually grinning creature? Why does his giggle elicit such blood lust that parents feel the need to trample and break the ribs of toy store employees to get their hands on his latest signature toy? Why does Googling the phrase “Elmo obsession” return 1.75 million results? There are undoubtedly many reasons for his universal appeal, but the most important one is very simple: Elmo is much like your little angel. I don’t mean to imply that your child is a muppet (although sometimes mine does resemble one); I mean that Elmo almost perfectly captures a toddler’s approach to and outlook on the world. He is “just like toddlers who are in a exploratory stage of life—like little scientists, trying out and exploring what is around them, delighting in it,” explains Tovah Klein, director of the Center of Toddler Development at Barnard College in New York City. And we all love characters we can relate to. Sesame Street muppets have distinct personalities and functions. Cookie Monster is the impulsive guy. Grover sets his sights high but is not so good at following through. Oscar is the neighborhood grouch. In the early 1980s, Sesame Street content developers realized that they didn’t yet have a preschool character, so they devised a list of attributes that they felt described the prototypic preschool child— “curious, open-minded, fun, loves to learn new things, very optimistic, happy-go-lucky,” explains Rosemarie Truglio, vice president of education and research at Sesame Workshop, the nonprofit organization behind Sesame Street—and they mixed them all together to create Elmo, who first appeared on the show in 1985. It’s not just that Elmo goes about his business like a toddler; he is also about as knowledgeable as a preschool child. He doesn’t know what big words mean and sometimes doesn’t know how to pronounce them, which kids may find comforting and amusing. 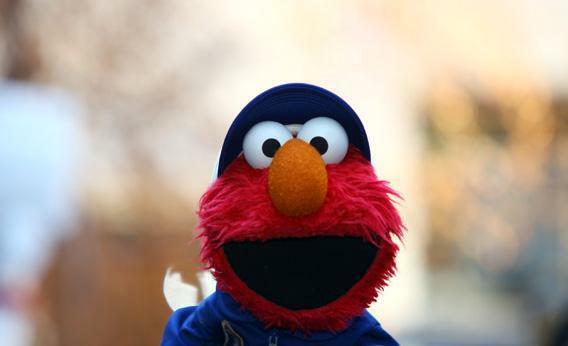 “Elmo spends much of his time approaching new things or situations,” Klein explains. “He tries something out and makes mistakes; he doesn’t know how something works or what it does.” It’s nice for kids to see other young characters who are as clueless as they are. Yet Elmo never gets frustrated or angry, and this incessant optimism is probably also appealing. Research suggests that seeing others smile and laugh can make us happier and healthier, too. Elmo’s (sometimes rather annoying) speech patterns are also immensely important. His jabber mimics “mother-ese”—it is high pitched with dragged out vowels and exaggerated inflections—which helps kids identify Elmo as someone they should listen to. “The style of it is very much, ‘this is for you,’” says Kathy Hirsh-Pasek, director of the Infant Language Laboratory at Temple University in Philadelphia. He refers to himself in the third person—Guess what Elmo’s thinking about today?—which is how many young kids first learn to talk about themselves. Elmo also talks directly to kids and tries to engage them, but in a respectful way. Other television shows, such as Dora the Explorer and Blue’s Clues, encourage viewer participation, but they do so somewhat forcefully, incorporating pregnant pauses during which kids are supposed to respond. Elmo’s World, the Sesame Street segment that premiered in 1999, doesn’t do this. Instead, the show invites kids to join in Elmo’s adventures without “[making] children feel awkward if they chose not to,” Truglio says. Then there’s the fact that Elmo is bright red. Funnily enough, this salient characteristic was not engineered. When it came time to pick Elmo’s hue, Sesame Street’s producers discovered that red was still unclaimed. Elmo’s redness undoubtedly helps his popularity: Some research suggests, for instance, that bold colors give preschoolers a sense of security. And, of course, red makes Elmo so darned easy to see. My son could spot that Elmo car as soon as he walked into daycare every morning, and that, I’m sure, helped to solidify their budding relationship. If your kid is Elmo-obsessed, how guilty should you feel about exploiting the love and throwing her in front of an Elmo’s World video so you can do the laundry? I’ll save the how-terrible-is-TV discussion for another column, but a little bit of Elmo on the tube may not be all bad. In a 2011 study, researchers at Georgetown University split 48 American 21-month-olds into two groups. One group watched a video of Elmo teaching them how to nest different-sized plastic cups inside each other. The other group watched DoDo, a character well-known in Taiwan but not in the U.S., doing the same thing. The kids who watched Elmo mastered the task far better than the ones who watched DoDo, which suggests that your child’s cementlike bond with Elmo has a bright side. Yes, it means that Elmo’s eerie smiling face will greet you every time you look in her toy box or bookshelf or pajama drawer. But that muppet will probably teach her a thing or two about the world, too.